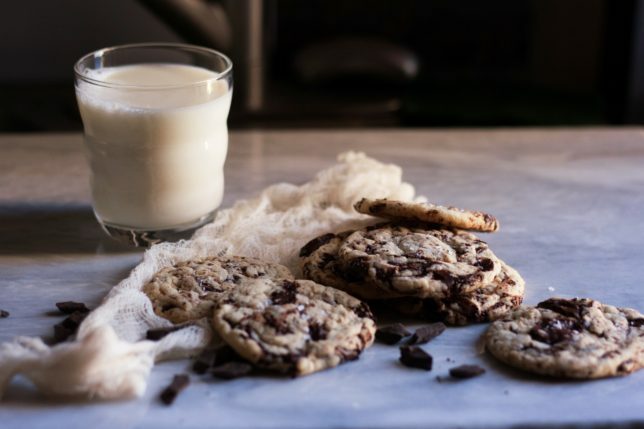 Do you remember when life was simple and all you needed for a delicious, well-earned, just-baked dessert was a Tollhouse chocolate chip cookie? Cream the butter and sugars, add the eggs and vanilla, add the flour mixture in three portions, stir in chocolate chips, bake at 375 degrees. In our quest for always better, always different, always new, I wonder if we’ve sort of lost sight of the basics. I’ve seen gorgeous recipes for dishes and desserts with 4,000 ingredients that you never thought to put together. 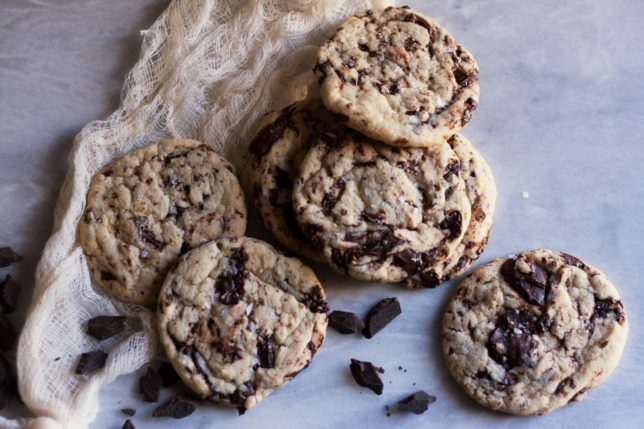 I, myself, proudly brown my butter and whisk it with sugar and eggs in four different stages, because, yes, I really, really like these cookies. These are the ones I want in my life every single damn day. And last week, I finally replenished my tahini supply and made these lovely Salted Tahini Chocolate Chip Cookies from Danielle Oron’s book Modern Israeli Cooking, reprinted earlier this year in the New York Times. Like the brown butter chocolate chip cookies, they straddle the classic and the different, yet are still entirely simple to make — you even cream the butter and sugar, like the olden days! 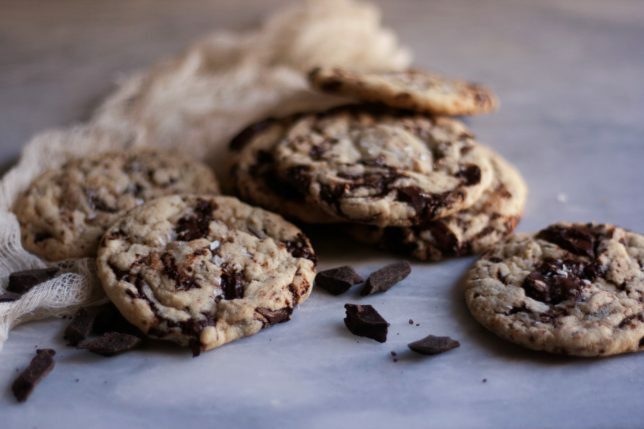 These cookies, once completely cooled, taste a lot like the classics. They’re pretty thin, buttery, and chock full of chocolate, especially if, like me, you chop up a bar. But just out of the oven, they’re crisp, they’re light, and they taste very much like a sesame candy or halava, only dappled with bittersweet chocolate. When you think of tahini, you probably think of falafel, of hummus. 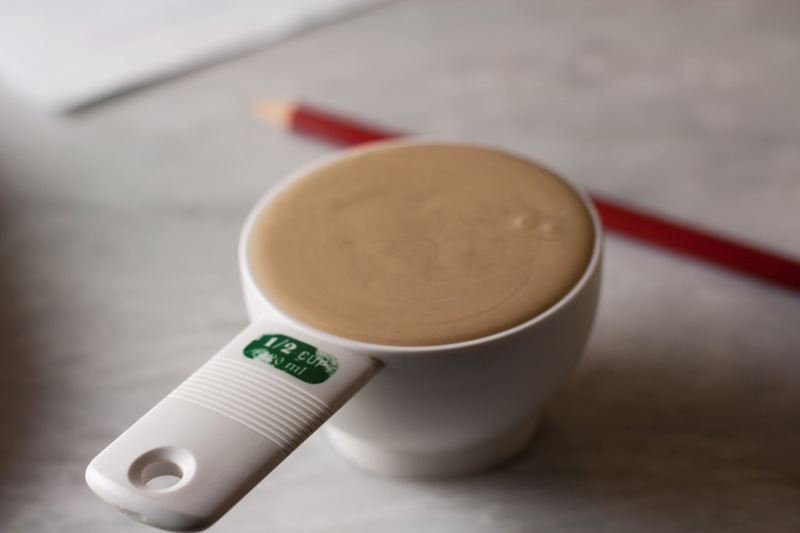 But as so many other bloggers and chefs around the world (see: Israel) have proved, tahini isn’t only for the savory. Molly Yeh stirs it into hot chocolate and folds it into cupcakes, Deb Perelman into hearty muffins. In this case, the sesame yields an earthiness, cuts the sweetness of what would otherwise be a pretty sugary confection. My friend Emily swung by on her way home after work to partake in these, and said it was everything she ever wanted in a chocolate chip cookie — crisp and chewy, all in one. Sold, to the lady over here, who asks for simple, but always secretly kind of wants something new and exciting and different –just maybe not with 4,000 disparate ingredients. These cookies? They fit me perfectly. A couple of notes before you begin: Danielle recommends that you chill the dough for at least 12 hours to relax the gluten and ensure tender cookies. Of course, that means that if you play by the rules, you have to plan ahead. I suspect that the cookies would taste just as good with a shorter rest in the fridge, but the dough is very, very sticky at room temperature. I found that it was much easier to scoop and shape the cookies when the dough was cold. That said, the original recipe from the book, as reprinted here and which I just found after the fact, recommends scooping the dough balls and freezing those, which is what I do with my usual brown butter chocolate chip cookies and allows you to bake off as many or few as you’d like. I’ll be trying this next time. In a medium bowl, whisk flour, baking soda, baking powder, and salt. Set aside. In the bowl of an electric mixer fitted with a paddle attachment, cream the butter, tahini, and sugar at medium speed until light and fluffy, about 5 minutes. Add the egg, egg yolk, and vanilla and continue mixing at medium speed for another 5 minutes. Add the flour mixture and mix at low speed until just combined. Use a rubber spatula to fold in the chocolate. Refrigerate at least 12 hours. 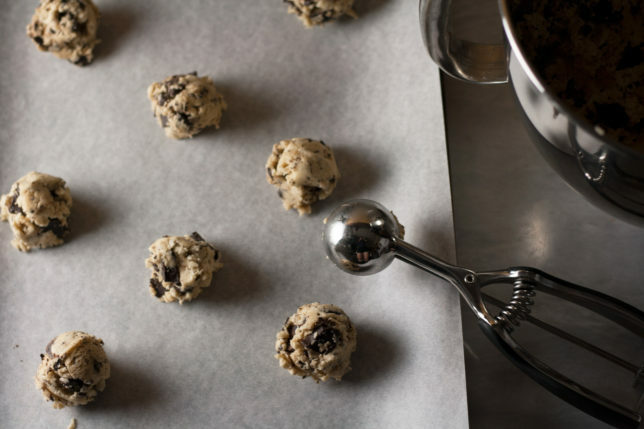 When ready to bake, preheat oven to 325 degrees and line a baking sheet with parchment. Scoop out about 2 tablespoons of dough at a time and roll into balls. Place on baking sheet at least 3 inches apart to allow them room to spread. Bake for 13 to 16 minutes until just golden brown around the edges — they will look slightly underbaked in the center. Immediately sprinkle them with Maldon sea salt or fleur de sel. Allow them to cool for 20 minutes before enjoying.